Why did Hi-Rez reintroduce the old timers? Thread: Why did Hi-Rez reintroduce the old timers? Does anyone who doesn't work at Hi-Rez like the new queue timers? Obviously they don't work so I'm guessing they thought if people saw there were only a few minutes of waiting they would queue. How often does this happen to you? To try to improve match quality. Essentially, instead of only being able to make teams out of people who have queued at a specific time, the timers now funnel everyone into a much larger pool to pick from at the end of the timer. Meaning that in theory there's more opportunity to find people with close MMR to put into the same game. Does anyone who doesn't work at Hi-Rez like the new queue timers? Notably, some Conquest players have noted an improvement in regards to quality of matches. Not very often any more. Though, it varies by region and time. Apparently, it's not very good over in OCE because of the already fairly low playerbase anyway. Personally, I play during prime time in EU for the most part so it's not so big an issue for me. But gosh is it annoying. If you play on off hours its almost worse then before now and u get that message a lot. But on peak hours MM is much better now. In pretty much every other gamemode, you'll almost never get that message unless you are playing during dead hours, or if you spam full premades. But since you are playing Siege, a practically dead mode, its very common to get something like that because the population of Siege is so pathetically small that the system stresses to find somewhat of a possible match for you. Each time i have quali people in my team (i am plat) i will remember those words.....before i hang myself. i play for fun ... no pff it is a lie ... i play for quests cause there is no more fun , 2x3'40'' for a game and then 50% chances to crash , 90% chances to have an afk/disconnected player , i dont even mention the bad matchmaking and bad teammates . i cant have fun that way. 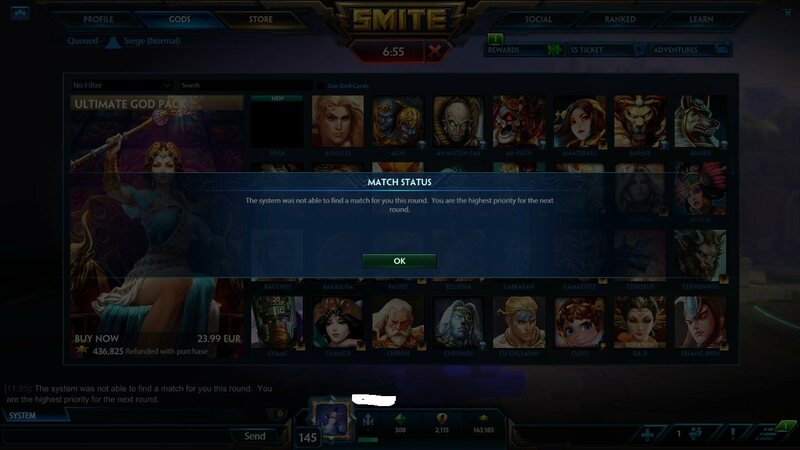 I was trying to queue for the siege MOTD a few days ago and I got this message three times in a row. I was playing during peak times as well. I had been waiting for 12 minutes so I just decided to quit the game and not bother trying to queue up again. At first I liked the new timers because it meant I knew exactly how long I would be waiting for, and since I play all game modes it also meant I could just join the one with the shortest queue time. But now since I get that message so much, it can be a little frustrating.